The Red 2 EQ is a six-band design emulating the original Focusrite hardware. 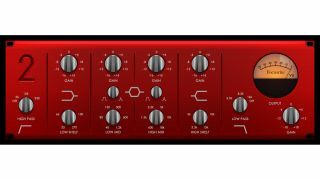 Focusrite's lauded Red 2 equaliser and Red 3 compressor hardware units are now being aped in plugin form (AU/VST/AAX), and are available to registered users of the company's Scarlett, Saffire, Forte and new Clarett audio interfaces. While the original units were both dual designs, offering EQ and compression for two signals, the Red 2 and Red 3 plugins narrow this down to one per instance, meaning a slightly redesigned layout, allowing for the addition of VU-style metering. Specifically, the Red 2 EQ is a six-band design, and high- and low- shelf and pass filters, plus two band-pass designs with variable width; and the Red 3 compressor includes standard Input, Ratio, Threshold, Attack and Release functions, plus an Auto Release button, Makeup Gain, and a Dry/Wet control to facilitate parallel processing. The Red 2 and Red 3 plugin suite joins Focusrite's previous Midnight and Scarlett bundles, which are available as AU/VST/RTAS plugins. The plugins will also retail, for those without the above Focusrite interfaces, for £229.99 ($299.99). For more, head to the Focusrite website.